Who can use this Artist Agreement? What is this Gallery Agreement for? The agreement sets out the role and duties of both the gallery and the artist when the gallery is going to exhibit an artist’s works. Gallery’s role. The gallery owner is likely to want control over the display of the works, albeit in discussion with the artist. 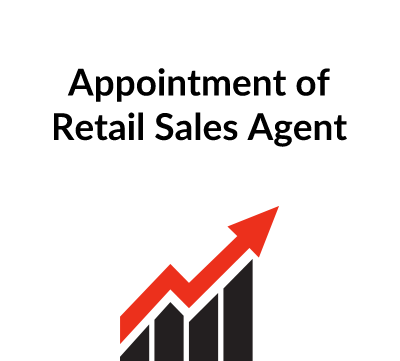 More mundane matters such as opening hours, length of exhibition and insurance obligations of the owner will be dealt with. Artist’s role. The agreement will identify the number of works to be displayed, and the artist will warrant that all works are original and the artist has copyright in those works. The artist is likely to be responsible for collecting unsold works at the end of the show. Pricing and payment. The owner and artist will agree on the asking prices and the agreement will say what flexibility the gallery has to negotiate the price with potential buyers.. The gallery’s commission will also be set out, together with the invoicing and payment arrangements. Promotional activities will also be covered brochures, preview reception etc., as well as responsibility for the cost of these items stop. 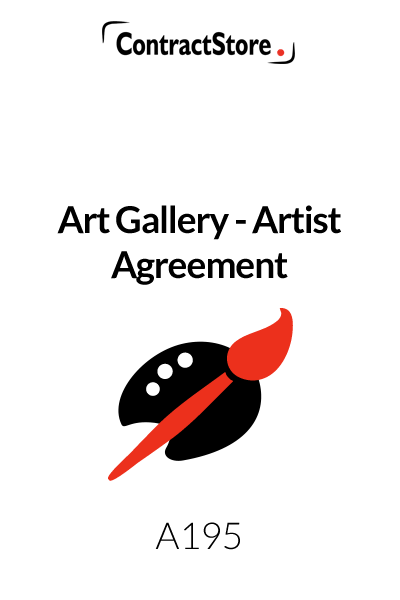 This agreement is suitable for use where the owner of an art gallery wants to have an agreement with an artist for an exhibition of the artist’s works which will be displayed at the gallery for a limited period of time. The agreement sets out the basic obligations of the Gallery Owner and the Artist as well as the commission and payment arrangements. 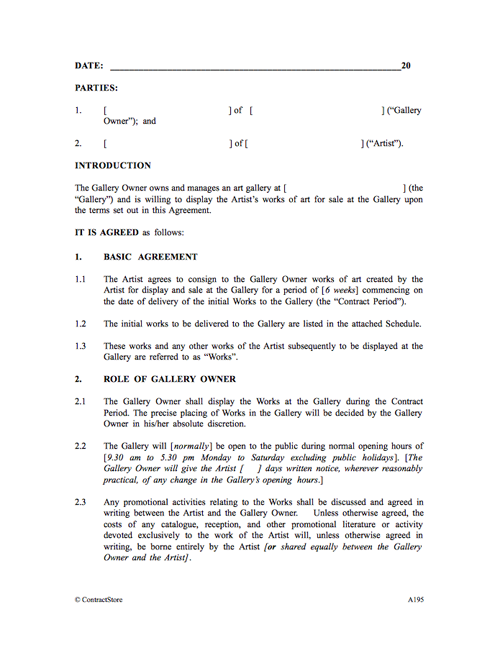 This clause states that the Artist will deliver to the Gallery Owner specified Works to be exhibited for an agreed set period with a view to sale. The Works delivered are to be specified in the Schedule. This sets out the obligations of the Gallery Owner. Clause 2.1 expressly reserves the right of the Gallery Owner to display the Works in the Gallery at his/her absolute discretion. If the parties agree that the Works are to be exhibited in a particular manner this should be stated in the agreement. Clause 2.2 specifies the opening hours of the gallery. A Gallery Owner should consider whether to reserve the right to alter the opening hours on notice to the Artist. Clause 2.3 provides that the Artist will be liable for promotional costs incurred by the Gallery Owner. If the costs of brochures, receptions etc are to be shared, then the wording needs to be altered. Clause 2.4 obliges the Gallery Owner to insure the Works during the time they remain in the gallery at his/her expense and also limits the Gallery Owner’s liability in the event of loss or damage to the Works to the amount recovered from insurers and excludes liability for uninsured losses. If the insured value is to include the Gallery Owner’s commission, the parties should specify whether the Gallery Owner may deduct agreed commission (see clause 4.1) from the insurance proceeds. The Artist should check the terms of any insurance policy before entering into this agreement and in particular any exempt risks, the amount of any policy excess and any limitation on the maximum amount recoverable in respect of any one artwork. It would also be prudent to ensure that each artwork is accurately valued for insurance purposes before consignment to a gallery. Accurate valuation is important not only so that the full value of an artwork stolen or completely destroyed is recovered but also to guard against insurers seeking to apply a pro-rata reduction in the amount paid out on a claim corresponding to the amount of any under-insurance. Whilst we believe that the limitation of liability to the proceeds of insurance is likely to be legally enforceable it is important to remember that this limitation will not apply in the event of exceptional circumstances – e.g. where loss arises from grossly negligent/reckless acts or omissions on the part of the Gallery Owner. Clause 2.5 makes it clear that the Data Protection Act might prevent disclosure of a purchaser’s name to the Artist; some buyers of art require anonymity so such a provision can be useful for the Gallery. This clause gives an explicit reassurance to the Gallery Owner that the Works do not infringe third party intellectual property rights and contains an agreement by the Artist to reimburse (“indemnify”) the Gallery Owner in respect of losses including legal costs arising from claims made by third parties claiming infringement of those rights. The Gallery Owner may wish to consider specifying that the right to reimbursement is as widely drawn as possible in which case in clause 3.3 the word “direct” should be deleted and the words “including indirect, consequential or special loss or damage” inserted. The converse will apply to the Artist keen to limit the scope of the indemnity. 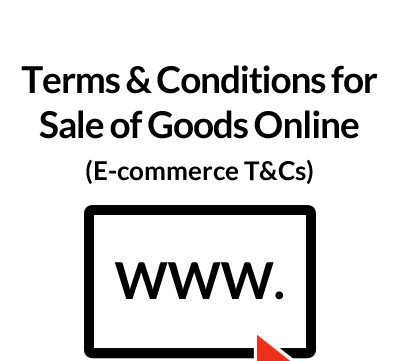 At clause 3.4 provision is made for the delivery of additional Works following the sale of a Work on display which the purchaser wants to remove. Obviously a written record in agreed form specifying the artwork, asking price and delivery date should be made. Clause 3.5 requires the Artist to collect the Works remaining unsold and to pay for any storage costs incurred by the Gallery Owner. Whilst the Gallery Owner is not liable to arrange insurance cover after the end of the contract period and would not be liable to reimburse the Artist for losses that would have been covered by insurance applicable during the contract period the Gallery Owner would be liable to the Artist for loss arising from dishonesty or gross negligence or recklessness. Provision is made here for the Artist to agree the price he will get for works that are sold and to this will be added the Gallery Owner’s commission. Clause 4.2 gives the Gallery Owner some discretion to agree discounts. Clauses 4.3 to 4.7 deal with the payment arrangements, in relation to both sales and expenses: our wording assumes the Gallery Owner will retain his commission out of the sale proceeds and pay the balance to the Artist. The VAT position may vary depending on whether both the Artist and Gallery Owner are registered for VAT – hence the wording of clause 4.7, and advice should be obtained here on the proper invoicing arrangements where VAT is payable. 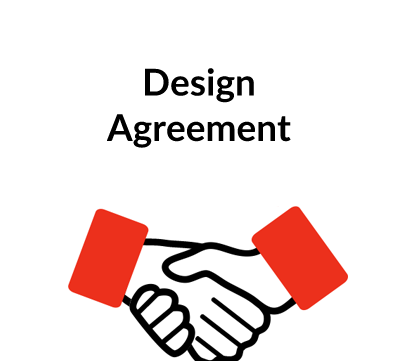 Both parties agree to keep the terms of the agreement confidential subject to exceptions. Neither party may transfer its rights or obligations under the agreement to a third party except unless agreed in writing. A standard provision ensuring that formal notices served under the agreement must be in writing. This gives either side the right to terminate the agreement if the other becomes insolvent or commits a breach of the Agreement. This is a standard provision in such agreements to avoid the risk that the agreement unintentionally establishes a partnership. An important provision making it clear that the entirety of the parties’ rights and obligations are as set out in the agreement. This specifies that the agreement is to be interpreted in accordance with English law and provides for the resolution of any disputes in the courts. If a different governing law is required –i.e. where the Agreement is not in England or Wales – or if arbitration is preferred to court proceedings, this clause will need to be amended. Our website has some free downloads on governing law and on arbitration as well as on alternative dispute resolution. See ContractStore documents Z138, Z139 and Z140.